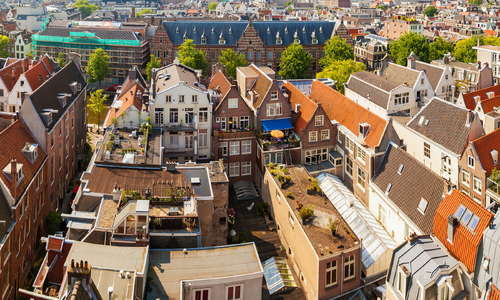 The biggest choice you'll make when deciding where to stay in Amsterdam is whether you want a hotel dripping with antique charm and old-fashioned character, or one with an ultramodern, design-focused vibe. Or perhaps a bit of both: many wonderful, historical buildings house übercontemporary hotels. Accommodations throughout the city are egalitarian, insofar as—no matter the budget—easy access to attractions and idyllic canal views are available to all, from grand hotels to family-run bed-and-breakfasts. On the high end, Amsterdam's crème de la crème deluxe hotels demonstrate how historical, monumental buildings can be modernized and transformed into state-of-the-art facilities with amenities that often include luxe spas and top-notch restaurants. Mid-range hotels are often found around the Museum District and Vondelpark, and include comfortable rooms and such desirable touches as private, guest-only gardens. On the budget end of the scale, visitors have their pick from inexpensive, cheerful properties offering a more personal touch, and a new batch of hip yet affordable spaces with see-and-be-seen bars. In fact, Amsterdam accommodations at all price levels are on a design kick, proudly displaying contemporary paintings and sculptures from Dutch artists throughout their public spaces and guest rooms. You may also choose to skip the ubiquitous (though undeniably lovely) canal-house-turned-hotel in favor of the former newspaper plant, diamond factory, tram storage shed, music conservatory, or even construction crane, all transformed into interesting places to lay your head. When it comes to hotels, some visitors will choose the latest design hot spot, others will always opt for lodgings in an archetypal canal-house hotel. If you're one of the latter, just remember to keep a steady eye (and hand) out when navigating those traditional Dutch staircases. If you're not nimble-footed, find out in advance if your hotel has stairs—how many, what type, and the degree of incline.